Simply talk to your phone: Android = OK Google, Set a timer for 15 minutes. John and Kathy have been fulltime RVers for about 10 years. 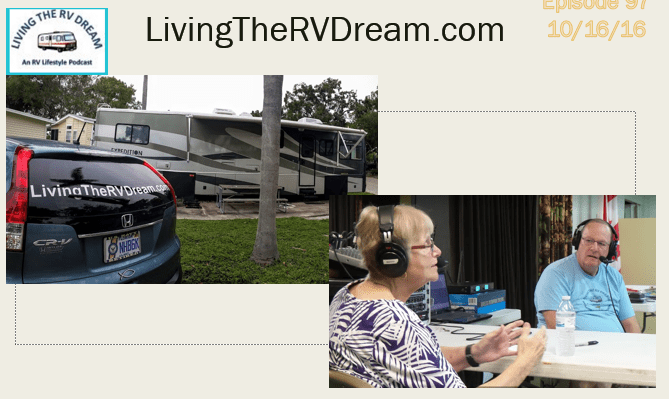 They are best known for their weekly podcast, “Living the RV Dream” and for their extremely popular Facebook Group: Living the RV Dream. Over 34,000 members and growing daily! They’ve also written a couple of RVing books. So You Want To Be An RVer? will tell you everything you might every want to know about RVing! 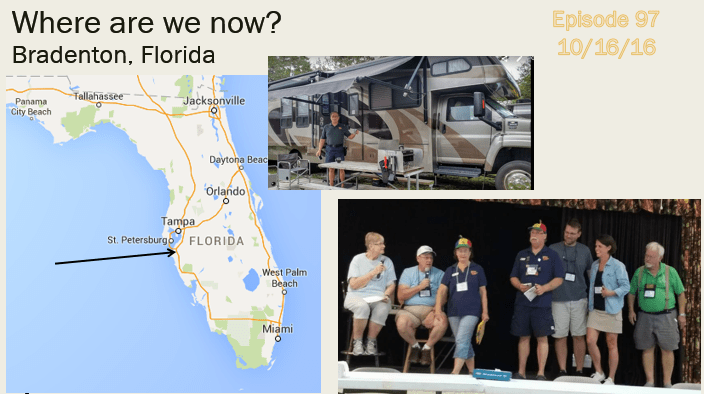 John and Kathy discuss how RVing has allowed them to see so many things in the United States. Especially Mr. Rushmore! Note: we had a little technical difficulty with the video for a while, but we covered with photos – and the live video does pick up here. 10:16 We talk with John and Kathy about Internet Technology on the Road. Eric and Tami bought TechnoRV from our friends Phil and Tracey May. Years ago, we put together our own RV rallies called Techno-Geek Learning Rally. Phil and Tracey have since moved back to their home in the UK. We are enjoying getting to know Eric and Tami. They talk about how they made the decision to go RVing. With 3 kids in college, they have a few more considerations than many of us! 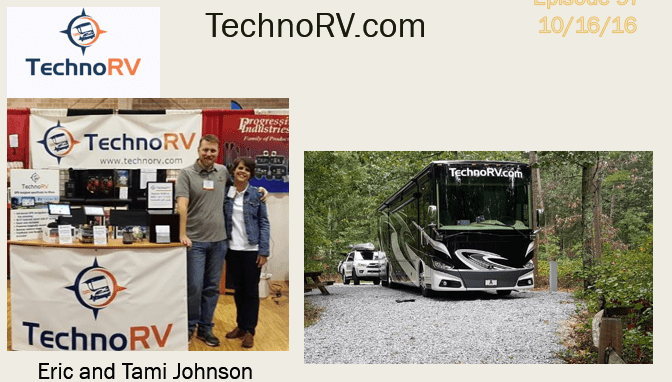 Eric and Tami are continuing the TechnoRV process of evaluating, using, and supporting products that are useful to RVers. They’ve done a great job of vetting their products, teaching how to use them, and supporting their customers. 25:16 Eric does a little bit of Show and Tell and teaching about his Wi-Fi booster equipment. Indoor antennas, outdoor antennas, and repeaters. Wi-Fi vs. Cellular. In addition to our App, both of our guests had some suggestions! Printicular is the only app we’ve found that can access your Google Photos. Choose the ones you want to print, send to the Walgreen’s nearest you and you can pick up your prints in an hour! 36:11 Tami gets excited about Google Photos!! She learned this week how easy it is to import her lifetime of photos from many different sources. Ends at 37:55 Complete Playlist of What Does This Button Do shows. Published by MrsGeek, in What Does This Button Do. Geeks on Tour tutorial video #445 Shows a quick trick on how to get the best possible cellular signal to your smartphone. Published by MrGeek, in Show-Me Video, Smartphones and Tablets. #72 How do I Connect to the Internet while Traveling? What Does This Button Do? Beginning Introduction: Coming to you from Ft. Lauderdale, Florida. With Chris Dunphy and Cherie Ve Ard of RVMobileInternet.com coming to you from an outdoor location in West Texas near Fort Davis. You will hear some wind sound because of this. iPhone: Settings->Personal Hotspot->turn it ON. You can configure the name of the hotspot and a password. Android (Samsung on Verizon Unlimited): Settings->More Networks->Mobile Hotspot->ON If you have a plan that allows you to use the hotspot feature directly, you’re done. If your plan does not allow it, this won’t work. You’ll get a message saying you need to Call Verizon Customer Service to turn on the feature. If you know your plan does not allow Hotspot, you can use the third party app called FoxFi. First you turn FoxFi on, then it will ask you to go the first setting and turn on Mobile Hotspot. Note: if you already tried turning on Mobile Hotspot directly and were denied (like we just did) this won’t work until you reboot your phone. You must start with the FoxFi app first. Android (Nexus on Project Fi) Settings->Networks->More->Tethering and Portable Hotspot->Portable Wi-Fi Hotspot=ON The first time you do this you need to Set up Wi-Fi hotspot by giving it a name and a password. 6:42 How to connect to the mobile Hotspot using your computer. On either Windows or Mac, just click the button to connect to a WiFi hotspot – you should see your phone’s hotspot show up on that list. Click it, click connect, enter the password. You’re on! 7:43 Introductions: Chris and Cherie of Technomadia.com and RVMobileInternet.com. They live fulltime in an RV – a converted vintage bus – and travel the country. They’ve written a book called The Mobile Internet Handbook and are constantly learning about the latest and greatest technology. They are currently parked outside of Fort Davis, Texas precisely because it has extremely poor Internet connectivity. They are testing a variety of cellular boosters to see which one is best. In order to get enough Internet to join us on this show they drove into the center of Fort Davis and set up at a park. They use their phone – on Verizon – as their WiFi hotspot in order to stream their video to us. Both Chris and Cherie are longtime technology geeks, Chris tells how he used to work for Palm Computing and he traveled the world to scope out the competition. Cherie ran a software development business and took that on the road when she met Chris. As long as they had mobile Internet, they could do their work. So they have become experts in that subject and they wrote THE book! 13:06 Overview of different methods to connect on the road. Cellular: from a hotspot device, or a cellphone, with a cellular service like Verizon, TMobile, AT&T or Sprint. Public WiFi Hotspot: there are Public hotspots almost everywhere, but don’t expect to have Internet connections like you’re accustomed to at home. You need to be close to the source of the hotspot, and you need to realize that a lot of people are sharing the same connection. Set your expectations! You will be able to check your email and check a few websites, but don’t plan to stream video. WiFi signals are very Line-of-Sight. 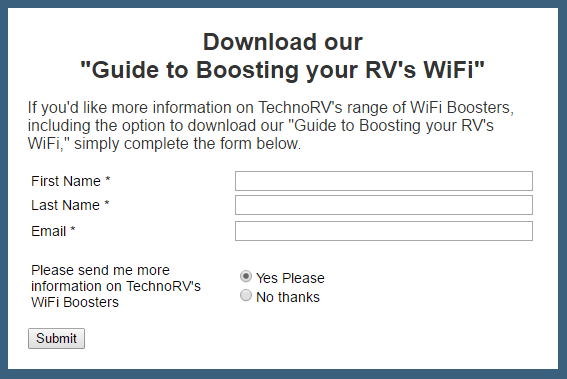 The best thing you can do for improving your signal at an RV park WiFi hotspot is to get your antenna up on the roof. Satellite: not appropriate for most people, it is very expensive. But for RVers who like to park in the wilderness, it is the only way to connect. 16:36 Is it safe to use Public WiFi hotspots? Most secure websites, like your Bank’s, use a protocol called HTTPS. If you look at the web address and see the S and a little padlock, it means you are on a secure connection – you are safe. The problem comes when you leave the secure website, go to some open website, like a forum and use the same password as you just did on the bank’s site. Don’t do that! Use unique passwords. What about using a VPN (Virtual Private Network) – yes, VPN services do provide complete security, but they add complexity and they slow down your experience. Chris D. mentions that there are advanced VPN services that can even make it look like you are connecting from a different country. Cherie says that VPNs are overkill, not recommended for casual users. Cherie shows the PepWave Surf on the Go The antenna on this device will pick up signal from a nearby Public WiFi hotspot and re-broadcast it to you devices as your own private WiFi hotspot. It can also us a cellular USB modem as the source for the Internet and re-broadcast that. WiFi-Ranger is a similar device but more powerful, and more expensive! Two new options in the past year. Roof mounted robotic dish with pay as you go service. RV DataSAT 840. Not available on tripod. Roof space is a problem if you have a lot of solar panels! A new tripod option is Mobile HughesNet Ka-Band from RTC. Verizon, AT&T, Sprint, TMobile. These work thru the cell towers and they go much longer range than public WiFi hotspot. You need to buy a data plan from one of these providers. Verizon has the best coverage nationwide in the US, AT&T is a close second, TMobile has doubled their coverage in the past year, Sprint is a far fourth. Only the newest phones connect to the new coverage with TMobile. It’s called Extended Range LTE, or Band-12. (Note: in order to read the full article you need to be a member of MIA (Mobile Internet Aficionados – Chris and Cherie’s private membership group) You can join here, and use the coupon code GeeksOnTourMIA for a discount.Do you need a hotspot device, or can you use your phone as hotspot? The problem with phones is that you want it with you. So if Internet is being provided by one person’s phone, and that person goes somewhere else, the Internet goes with them. Or, when you both leave, there is no way to have a remote monitoring device on. Chris and Cherie like using a Hotspot (aka MiFi or Jetpack) device as their primary Internet connection, then use their phones as hotspot when they need more. 28:29 Chris G. asks about using the SIM card from one of their Verizon phones (with Unlimited data) and putting it into a hotspot device instead. YES! Verizon allows this. Verizon is under legal obligation to allow the hotspot feature and not to throttle their unlimited. Although you can put the SIM card into an older hotspot device, an old device will not be able to access the new XLTE signal. XLTE is like the carpool lane. To avoid overcrowding on the primary signal ‘lanes’ the XLTE is rolling out, but you need a current device to get into that ‘lane.’ The newest Jetpack is the AC791-L. The 5-bar, or 5-dot, indicator is just the phone’s interpretation of the signal strength. Speedtest.net and the Speedtest app is how to test the actual throughput speed. Sometimes there is no correlation between the signal strength and the actual speed. Speed is what counts. Chris D. demonstrates how to take the jetpack apart to see the SIM card. Take out the one there, and insert another. The SIM card (Subscriber Information Module) is the identification of the contract to connect to the cell tower. TMobile is the gold standard for this! TMobile plans cover “Mobile without Borders” Your plan will work just fine, you just don’t get the Binge On feature. TMobile also works in Europe, but not high speed, just 3G speeds. TMobile for travelers is awesome. Verizon also allows International use for a $2/day in North America and $10/day around the world in their partner countries. , just not with the old unlimited plans! See details at Verizon International services page. 36:58 How do I track my data usage? 1. Turn off all syncing for photos on Google Photos, Facebook, Dropbox etc. 3. Turn off automatic video playing on Facebook (see Geeks on Tour video on how to do this: 410. Facebook on Android – Stop Video Autoplay *FREE)Monitor your data usage with tools from your provider. You can set up notifications for when you’re getting close to your limits. You can change plans mid month if you need to. On current TMobile plans, you can watch certain streaming video sites without the counting against your data cap. HBO, Netflix etc. but not Youtube. Because of their plans, TMobile is the perfect 2d plan for travelers. Verizon or AT&T for the coverage, TMobile for all the goodies. These Technomads also write apps for iPhone as a side hobby. A great one is for US travelers to see what carrier has coverage in the areas you’re going. It’s called Coverage, Two Steps Beyond is their company. Easily know before you go: Avoid having to check each provider’s coverage map individually to know where you’re most likely to keep connected. No internet needed: All maps are stored locally, so you can see where coverage next is most likely even when you have none. Urban and rural maps: Maps cover the entire continental USA for Verizon, AT&T, Sprint and T-Mobile. Know where to roam: view LTE, ‘4G’, 3G, 2G and roaming areas as separate overlays, focus on the coverage type you need. Universal App – iPhone, iPod Touch and IPad, OS 5.1 and higher. 1.T/F If you buy the right equipment, and know how to use it, you can get online ANYWHERE. 2.Which cellular carrier is generally accepted to have the best nationwide coverage today? 3.If you have a smartphone, you can share its Internet connection with your computer by turning on the _______________ feature. 4.You pay for cellular access based on the amount of Data you use. How do you keep track of that amount? 5.T/F If you buy an antenna to boost the reception of your cell phone, that will also help your computer connect to a Wi-Fi Hotspot. Ends at 52:59 Complete Playlist of What Does This Button Do shows. Here is the second in our series of Review Questions from our “What Does This Button Do?” show. These are not mulitple choice, and many have more than one right answer so this is not a test that can be graded like a college entrance exam, but if you want to see the discussion of our answers to these questions, you can click the link provided. The link will take you to the time in the specific episode where we start the discussion of review questions. Since we have produced 68 episodes so far, this “Test Your Smartphone Smarts” will be an ongoing series of posts here. When you delete an email from your phone or tablet, is that email deleted when you view your inbox on the computer? To back up a step while using your iPad or iPhone, look for a left pointing arrow in what corner of your screen? If the Back button is never visible on your Android, check the settings for “Touch Key Light duration” under the _____________________ menu. What are the two ways to connect a smartphone to the Internet? If your phone is connected to Wi-Fi will it use cellular data? If you click the time link, you will be viewing the YouTube video for that episode. The link takes you directly to the end of the show where we discuss the review questions. You can always drag the video play-head to the beginning to watch more of that episode. And, if you are a premium member of Geeks On Tour, you have access to the show notes for each episode. You will find all show notes on the Weekly Show page. So, how did you do on the questions? Leave any comments below! To enjoy full access to the Geeks On Tour Library of “How To” Videos and the Weekly Show Notes sign-up for a membership today! 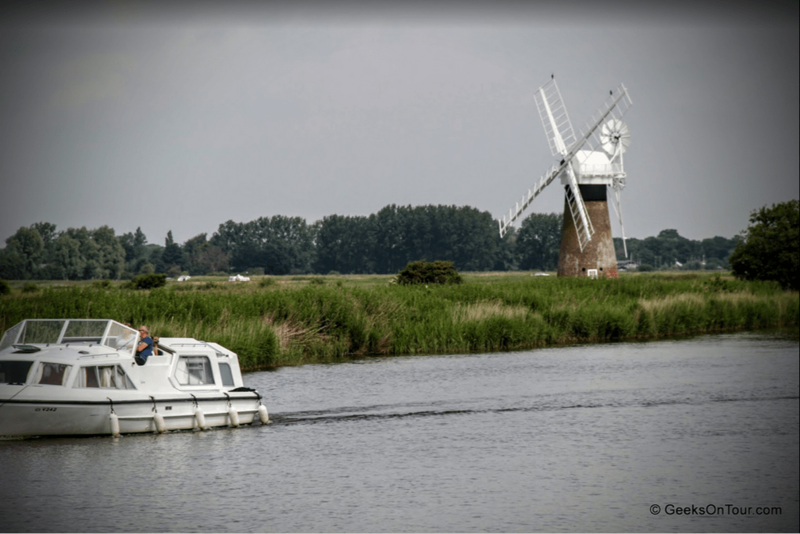 Published by MrsGeek, in Blog, Quizzes. 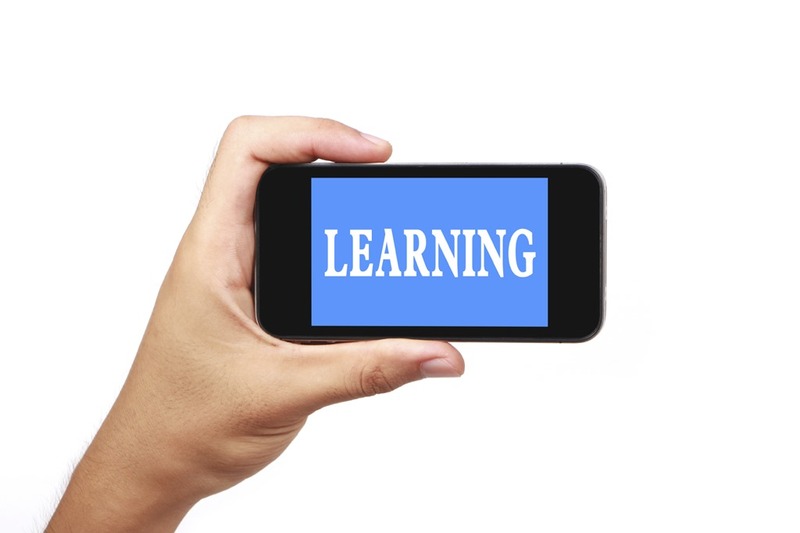 How do you Learn Smartphone Basics? I know that some people got a brand new shiny smartphone over the holidays. If it is your very first smartphone, where do you start? With everyone around you using their phones constantly you figure you can just ask for help, right? But they grab your phone, tap here, drag there and give it back to you. You still don’t know what to do, but you don’t want to look too stupid, and you don’t want to bother them anymore – they have texting and posting to do! Read on, this article is for you. What Kind of Phone did you Get? There are two main types of smartphones – iPhone and Android – and your instructions will differ depending on the type you have. With tablets, there are the same two types and the instructions are basically the same. So what is yours? All you have to do is hold it upright and look at the bottom. If you see a round button, you have an iPhone. It will also have an Apple logo on the back. If you don’t have a round button, it’s probably an Android. The third option is a Windows Phone, you will see a Winodws logo – very few people have those and we don’t cover the specific instructions. There is a LOT to know about these devices because they do so much, we livecast a weekly, 40 minute Youtube show on using Smartphones and Tablets. We’ve recorded 66 episodes and we’re just getting started! Episode 66 is on this topic: Learning the Basics, just click to watch the show on Youtube. Before you can go too far with using any given function on your phone, we think there are some basics about using the device that will get you started. If this were a car, we’re talking about knowing how to lock and unlock the door, start the ignition, use the accelerator, brakes, and gearshift, and how much to move the wheel to accomplish your turns. Only then can you start learning about getting to your destinations. If your phone is on and you press the power button, it appears to turn off, but its not. It’s just asleep. The screen is off, but the phone is still on. You should never leave the screen on when you’re not actively using your phone, it drains the battery faster than anything else. When the screen is off and you press the power button, the screen comes on – it wakes up – but it may be ‘locked.’ The ‘Lock’ screen is what is shown until you swipe the screen to get to your Home screen – the one with all the icons. If you have security turned on, and you should, then you need to enter a passcode, or use your fingerprint, or some other procedure to unlock it. This is so someone who steals your phone can’t get in and see your stuff. To turn the phone off, powered off, you hold down on the power button until a message appears on the screen, follow the instructions on the message. How do you know it’s off? If you give a short press on the power button and the screen doesn’t come on – then the phone is powered off. To turn it on, you need to hold down on that power button (aka the Sleep/Wake button) until you see something happen on the screen. Usually, you will first see a logo then it takes a minute to come fully to life. Speaking of turning it off and on reminds me of our friend Abby Stokes’ book, Is This Thing On? She calls it A Friendly Guide to Everything Digital for Newbies, Technophobes, and the Kicking & Screaming. Check it out on her website, AskAbbyStokes.com. These are very touchy devices. You need to get some practice in learning how your particular device likes to be touched. If you find a game you like to play on it, that is a good way to get practice. If tapping an icon doesn’t seem to work, do not tap it harder! You may be issuing another command entirely, called a longpress. That is when you touch and hold on a spot and something is programmed to happen. On an iPhone, if you touch and hold on an icon on a home screen, you will see all the icons start to wiggle. That means they are ready to move. You can drag one to another spot, you can even drag one on top of another and they will combine into a folder. When you’re done, you press the home button (the round one, remember?) to stop the wiggling. If you have a mapping program (App) open, a longpress does something quite different – it drops a marker on the map. With the map, you can use two fingers on the screen, pinch them together, and the map gets smaller, zooming out to show you more. With the same two fingers on the screen, if you spread them (reverse pinch?) you will zoom in to a closer look at the map. Double-tap does the same thing – zooms in. One finger on the screen, dragging around, moves the map to a different location. If you’re viewing a photo, double-tap will zoom you in, enlarging the photo. Another double-tap will zoom you back out to the original size. The point is to try these ‘gestures’ they’ll do something different in each application, but they’ll almost always do something – and you’ll learn. Tapping an icon opens that App, then tapping something within the app takes you somewhere within the App. If you want to get back to your phone’s starting place, that’s called Home, and guess what?! The Home button will take you there so you can start over with something else. On Android devices there is a dedicated ‘Back’ button. It is represented by some kind of arrow, and it is beside the Home button. If you don’t see it, tap anyway, it may light up. So, if you tapped an App, let’s call that ‘level 1’, then you tap a button within an App to get to ‘level 2,’ and then another to ‘level 3.’ If you now tap the Back button, you’ll get to level 2, tap Back again to level 1, tap Back again and you’re back to the Home screen where you first found the icon for the App. The Back button is great for backing up one or two steps, but remember the Home button to get you all the way back to the starting point. iPhones do not have a Back button, but most Apps will show an arrow at the upper left corner to back up one step. Let’s say you opened a map App to look up a location. You pinched and zoomed and dragged to get in the vicinity, but then you couldn’t remember the name of the city. That information is in an email. So, you tap your Home button to go home, swipe thru your Home screens to find your Email App, open it up and find the email with the information. Now you want to get back to the map. You could tap Home again, find the icon for the Map App and tap it, but since you were just there, the Map is called a “Recently Used App” and there’s a button for that! It’s called Recent Apps. On an iPhone you get to Recent Apps by double-tapping on the Home button. You should now see a screen with a representation of all your recently used Apps with the most recent at the bottom. Tap the Maps App from there and your right back where you were. Now you need the address from the email? No problem. Go to Recent Apps (double tap on Home) and Email will be right there. On Android, the Recent Apps button can be very different from phone to phone. On my Samsung Galaxy S5 it’s to the left of my Home button and it looks like two overlapping squares. On my older Motorola phone, there is no dedicated Recent Apps button, I need to longpress on the Home button. This function is also referred to as Multitasking. The Recent Apps view is also how you close an App – you swipe it off the screen. REVIEW Questions: we end every show with Review Questions. Here are the questions for Episode 66 on Learning the Basics. You can watch the video where we answer these questions. 1.The power button is also known as the Sleep/Wake button. What other button can Wake a sleeping phone? 2.What do you do with the power button to turn the phone OFF? 4.If you’re on a call and you need to look at your calendar, what do you do? 5.If you don’t see an App, yet you know it’s on your phone, what can you do? 6.If you don’t have a dedicated Back button (like on iPhone) where do you look for an onscreen Back button? Published by MrsGeek, in Blog. The hotel’s WiFi hotspot was on the 2d floor, period – no access in your room. We were pleasantly surprised at the speeds. Nowhere near as fast as what we’re used to, but much better than we’ve experienced on cruise ships. There was one weird thing – we could not access our PayPal account. Access Denied! I thought maybe it was blocked by the government so as not to allow transfers of funds – and that may be the reason – but we were able to access our regular bank accounts with no problem. And, we seemed to have full access to any social media sites we wanted, like Facebook. 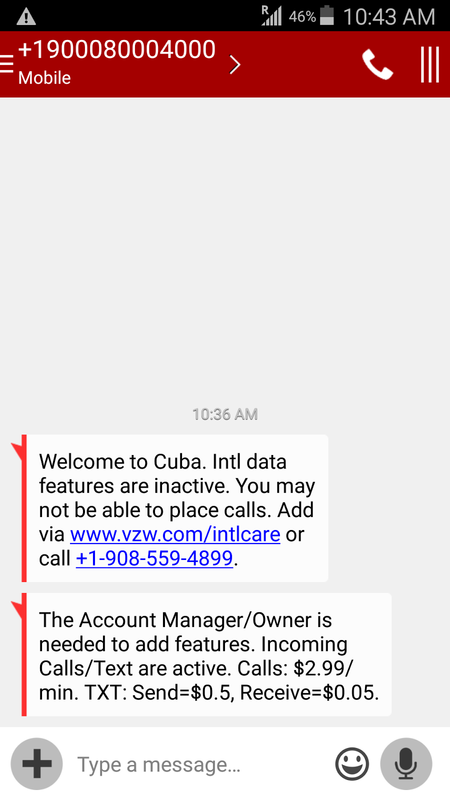 We did actually receive a couple calls and a couple texts during our stay in Cuba, but when we tried to answer the call, or reply to the text, it just didn’t work. We really don’t care about phone calls or texts, what we need is data – an Internet connection to manage our website and customer emails. We saw people with smartphones everywhere, so we thought we’d investigate buying a local SIM card – like we did in Europe. Yes, indeed, we could purchase a SIM card with service from Cubacel. We were told the price was $40US – just for the card! Not for any service. We were still considering it – not that we NEED the Internet that much, we just consider it part of our job to do this research. But then we heard the final bad news – “Oh No Señor, there’s no Internet here!” only voice and text. The cell towers in Cuba are only 2G. You need 3G or 4G for data/Internet. Wow! So, what were all these people doing with iPhone and Android devices? Just voice and text? We learned that just outside the hotel, on a street known as the Rampa because it runs like a down ramp to the sea, there is a public WiFi hotspot. You need to purchase an access code for $2-3/hour. So that’s what all these people were doing, sitting on the walls next to the sidewalk, they were accessing their emails, Facebook, and using Skype to make calls to the US. But as soon as they leave the immediate area of the hotspot … Internet gone. They really have no idea what these phones can do since they so rarely have an Internet connection. No signs were necessary to find where the local WiFi hotspot was! A submarine cable map drawn from Global Bandwidth Research Service. Click to go to the source map. Although the US Embargo definitely limits the communication, the Cuban government also has something to do with it. According to this article from the Economist, in 2009 the Obama administration authorized American companies to provide internet services to the island but the Cuban government wasn’t interested. If you followed the events that led up to the re-opening of the American Embassy in Cuba you know that there was an exchange of prisoners between US and Cuba. The Cuban prisoner was a man named Alan Gross – they say he was in a Cuban prison for being an American spy, but do you know what he was doing? Installing equipment for Internet access!! We have a passion for learning history! 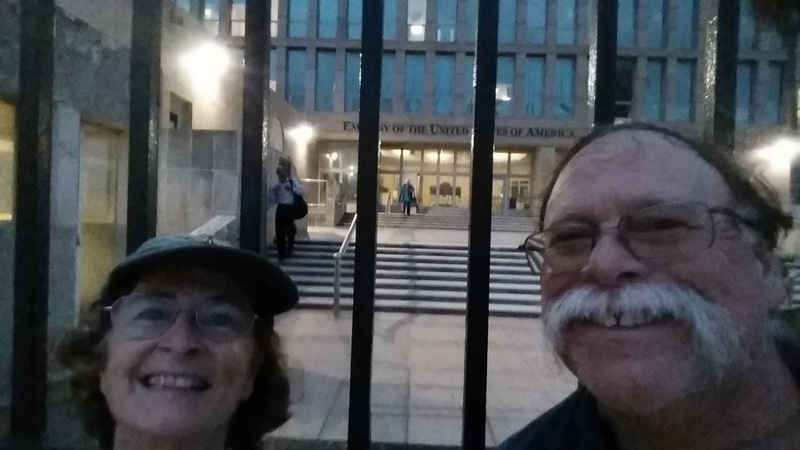 We just had to take a selfie in front of the recently re-opened US Embassy in Havana. We learned that people who are desperate for Internet information have formed a type of ‘sneakernet’ called The Package. Someone with Internet access at a business collects a Terabyte of data from various websites and saves it to DVDs or maybe external hard drives? Then they charge $2/week to distribute this “package” to those who want it. $2 may not sound like much, but when a government worker (and most all Cubans are government workers) typically makes $20-30/month, that’s a lot of money. A neighborhood might pass the package around and share the cost. I think I also heard this referred to as an IntRAnet. Here’s an NPR story on the Cuban Internet Package. Here’s another story about how young people are forming Internet ventures in spite of the obstacles. We were only totally without connectivity for 4 days – I kind of enjoyed it. My phone was still in my hand most of the time, because it was my camera, and my note taker. I also wrote a few emails, knowing they would get sent as soon as we were back in the States. But, generally not worrying about email or business was nice for a few days. I’m sure going to pay attention to increased Internet access in Cuba though. We would love to go back and spend much more time someday – but we need Internet for that. Further your computer education**Subscribe to the Free Geeks on Tour Newsletters**Watch our Weekly Online Show on Learning Smartphones and Tablets! #63 Connecting to Internet with Cellular or Wi-Fi. What Does This Button Do? Windows has released their latest OS to the public. It started rolling out to computers via Windows Update on July 29. I don’t necessarily recommend everyone upgrade their computers right away. There is no hurry, especially if you are doing ok now. If you do decide to upgrade I recommend having a current backup of your important data and performing a disk cleanup to get rid of junk on the drive. A high capacity and stable Internet connection really makes a difference. I can only be responsible for the safety and security of my own computers, not yours. There are two main reasons for any update. Number one is to fix bugs. Number two is to add functionality. Bugs can include security holes in the software. Hardware is changing all the time and the OS needs to adapt to make use of the advances. New software is made for new hardware, and vice-versa. If you are running old or limited hardware, you may have problems upgrading. I have been an early adopter of the latest and greatest(?) operating systems from Redmond going all the way back to DOS 2.1. This upgrade is most interesting in that I have heard very few complaints about it. Indeed, I have mostly heard acceptance and even some grudging praise about Windows 10 from the gurus I follow and trust. I installed this upgrade on our ASUS laptop (just used for seminars) as soon as it showed up in the system tray. I did not need to do anything special and it worked fine. My Surface Pro computer did have a hiccup the first time through the upgrade. I was low on disk space on the C: drive. The install automatically rolled back to Win 8.1. I used the standard Disk Cleanup to free up some space and tried again. This time it upgraded just fine. I have heard some reports of device drivers not working initially, but there is usually a fix for those. My Bluetooth keyboard and external monitor only came to life after a couple of reboots. We were in the middle of a rally where we rely heavily on the seminar laptop for our presentations and live demonstrations. I didn’t even notice much of a change. That’s the thing about operating systems. You don’t really use them. They are just the way to get to your programs so you can get your work done. All my programs work fine, even Photo Story 3, which was made for Windows XP. I do appreciate that Microsoft listened to unhappy users and brought back the Start Button. The new IE replacement Edge Browser has some cool features that I will report on as I learn more. I am still using Google Chrome as my primary Internet browser. Mobile users and those using metered data plans need to be aware that the download can be quite large and can easily put you over your monthly data allotment. If that is you, I recommend connecting to a public WiFi at the library or such. In addition, there are some settings everyone should be aware of to lessen data usage. The Windows Update Delivery Optimization (WUDO) is a new way to distribute important updates. But, if you are using a limited wireless connection to access the Internet, it will use large amounts of data. It is optional and you can save precious bandwidth by disabling it . Another potential data thief is WiFi Sense. It’s a reciprocal feature introduced in Windows 8 that can let your contacts share your WiFi network without knowing your network password. It in turn connects you to networks and hotspots that your contacts share with you. It is only for Internet access; they can’t see your passwords and stuff, and you can’t see theirs. Turn off the connection sliders. If you have upgraded to Windows 10, let us know how it went for you. If you are putting it off, let us know why. If you prefer Mac or Linux, or anything else, that is fine. Just please ignore this post. Published by MrGeek, in Blog, Uncategorized, Windows 10. #43 Internet Abroad. What Does This Button Do? Internet access while traveling has been a primary topic of ours for many years. But we’ve only traveled in the US. Now we’re on a trip visiting friends in England and we’re taking the opportunity to learn about Global Internet access. Use local Wi-Fi hotspots. Turn off the phone’s mobile data, or turn on Airplane mode. Use your cell provider in Roaming mode. Depending on your provider, this can be very expensive (Verizon) or included at no extra charge like with T-Mobile. Buy a SIM card from a local provider and put it in your phone. When I turned on my Verizon phone after landing in London, I got the message: Allow Data on this trip? If I said Yes, there would be “substantial” charges. Or, they gave a number to call to arrange for a global plan. A global plan from Verizon would have cost us $25/100 MB. Since we can use 100MB in less than an hour that was not the plan for us! Jim’s iPhone on T-Mobile rang while we were walking through a field near Cambridge. It was someone from Virginia who had dialed his normal, Florida-based phone number. They chatted for a while and took care of business, without even knowing where we were. Jim’s Nexus 6 appears to be his phone of choice. This was the device he used for Google Maps to navigate from Cambridge to Methwold, and from Bexhill to Belgium. While I was feeling quite out of sorts not being able to access any internet resources on my Samsung, not even a local map. While at our friends’ house, we were able to use their Wi-Fi. For the couple of nights we stayed in a hotel, there was good, free, Wi-Fi available, and several of the pubs and restaurants we visited also had free Wi-Fi. But, this didn’t help when we were in a car or on a boat.